Italy - Live show, event and broadcast video specialist Event Management based in Milan, Italy, expanded their investment in Kinesys automation equipment to service the latest series of the popular TV show, Io Canto. 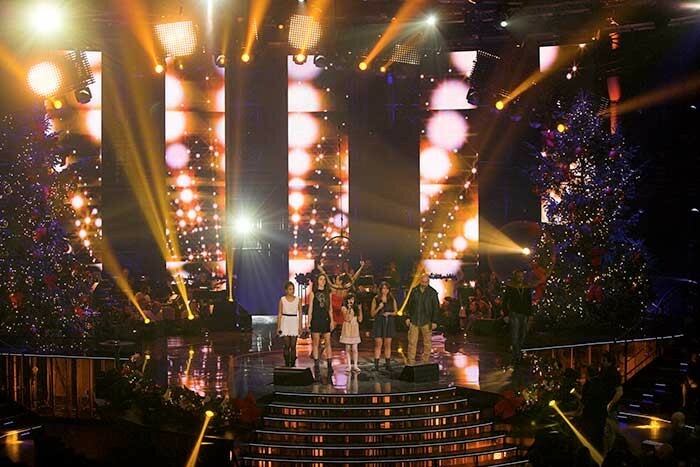 The fourth edition of Io Canto was recorded in Studio 20 of broadcaster Mediaset’s Cologno Monzese complex in Milan and aired nationwide on Channel 5 HD. Its quest was to discover the best new singing talent amongst young people aged 5 – 16. The production and lighting design for this year’s Io Canto was created by Francesco de Cave who worked closely with set designer, Marco Calzavara. It was Marco Calzavara and de Cave’s idea to have six large columns of moving 8mm LED video screen at the back of the stage. Each measured 8 metres high by three metres wide, weighed a sturdy 800kg and moved along a curved track based on an 11 metre diameter circle, mirroring the spherical design of the stage. He also wanted four front truss pods – each containing six Clay Paky alpha Beam 700 moving lights and clad on the audience side in Chromlech Elidy LED matrix panels - also supplied by Event management - to move. He contacted Event Management’s Daniele Parazzoli to help engineer a solution, who in turn proposed two separate Kinesys systems, each with K2 control. Event Management made their first investment in Kinesys at the end of 2012 because they wanted “A flexible and dynamic system that enabled us to offer the best and most inventive technology in the field to our clients,” explains Parazzoli, adding that having Kinesys in the inventory has really put the company into a different league in the Italian rental market. When their Kinesys system was confirmed for Io Canto, they added to their existing stock. For Io Canto, the six rear LED columns were moved by six Kinesys beam trolleys at their bases fitted to 40 metres of custom built curved track, which Event Management designed and had specially fabricated. At the top, the columns were rigged to six trussing sections each fitted with a Kinesys LibraCELL, so all the positional and tracking data for the movement could be fed back to an iPad, that could be used anywhere in the studio to monitor the system and check it was always running safe. The front truss pods were moved by eight half-tonne Liftket motors with Kinesys Elevation 1+ drive units. One of the two K2 control systems complete with full tracking backup moved the LED columns and the other took care of the front truss pods, operated by Frederico Galiberti and Teo Mancari respectively for the series. De Cave – who is also a prolific show designer - first worked with Kinesys products on tour with Italian singer Tiziano Ferro in 2012 and was seriously impressed. 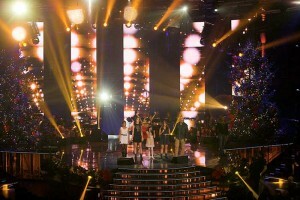 He specified it for Io Canto because, with 11 shows including the Christmas Special, he knew that having automation on a couple of key structural elements would bring exactly the diversity and variety of looks they needed to make each episode visually different and interesting to millions of TV viewers and a weekly live studio audience. “Kinesys is highly accurate, safe and reliable. I needed a system that could open, close and align the back video columns to within a 1mm tolerance and it’s the best system I currently know of for achieving this,” he states. Part of Event Management’s commitment to the Kinesys brand has included training at Kinesys HQ in London for their key technicians, enabling them to maximize their knowledge of all the system elements and the sophisticated K2 control platform. This further enhances the company’s ability to pitch for projects requiring bespoke and imaginative automation elements … as in addition to all their live / broadcast video requirements.